A hip fracture is a debilitating, painful injury. Each year, over 300,000 people are hospitalized for hip fractures in the U.S., most often as a result of a fall down or slip and fall accident. In fact, 95% of all reported hip fractures occur due to falls, with most of these injuries occurring due to a sideways fall. Fall downs (or premises liability), nursing home accidents, car accidents and work related incidents frequently cause hip fractures. Our personal injury law firm has successfully helped clients coping with a devastating hip fracture obtain the valuable compensation they deserve after an accident occurs. A hip fracture is a break in the upper quarter of the femur, or thigh bone. The hip is essentially a ball and socket joint that allows the upper leg to bend and rotate at the pelvis. The extent of the break can depend on the forces that are involved, and the type of surgery used to treat a hip fracture is usually determined by the bones and soft tissues that are affected. 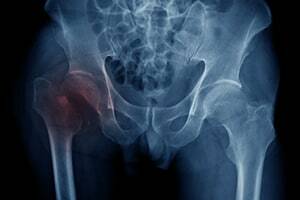 What Most Often Causes a Hip Fracture to Occur? Hip fractures most commonly occur from a fall down (trip and fall or slip and fall) with a direct blow to the side of the hip, often due to a wet, slippery, or icy walking surface. Medical conditions, such as osteoporosis, cancer, or stress injuries, can weaken bones, or sometimes make hips more susceptible to breaking. What is a Typical Hip Fracture Settlement Worth? Hip injuries are serious, and the settlement value of a typical hip fracture often reflects this. When medical bills alone are in excess of $100,000, a hip fracture case may settle for a multiple of this amount, with settlements for a hip injury sometimes ranging between $300,000 to $500,000, and perhaps more. Each case is different, and the amount reached in settlement sometimes depends on other factors, such as a client’s specific medical history (whether the client endured a long or complicated recovery, and if client’s injury will likely cause a permanent disability) and the facts and circumstances of the fall down itself (whether the client was comparatively at fault in contributing to the cause of the accident). Who is Most Likely to Suffer a Hip Fracture? Most hip injuries are more commonly suffered by older adults (age 65 and older), with the vast majority of hip fractures being caused by fall down incidents. Women are more likely than men to experience a hip fracture in their lifetime, with over three quarters of all hip fractures reported by women. Unfortunately, because some older women may suffer from osteoporosis, a common disease that weakens bones, healing and recovery after a hip fracture can be lengthy and difficult. According to the American Academy of Orthopedic Surgeons, patients with hip fractures often report pain over the outer upper thigh, or in the groin. There will be significant discomfort with any attempt to flex or rotate the leg. If the bone has been weakened by disease, aching in the groin or thigh area for a period of time may be noticeable. If the bone has become completely broken, the affected leg may actually appear shorter than the uninjured leg. Imaging is the most effective method of diagnosis, often with an X-ray. In some cases, an incomplete fracture may not be visible on a routine X-ray, and an MRI (magnetic resonance imaging) study may be ordered. An MRI scan will usually confirm a hidden hip fracture. In some cases, a CT (computed tomography) scan may be ordered. What are the Specific Types of Hip Fractures? In general, there are three types, often depending on what area of the upper femur is involved. Intracapsular fracture. An intracapsular fracture occurs at the level of the neck and the head of the femur generally within the capsule, or soft tissue envelope, that contains the lubricating fluid of the hip joint. Intertrochanteric fracture. An intertrochanteric fracture occurs between the neck of the femur and the lower bony prominence called the “lesser trochanter” (an attachment point for one of the muscles of the hip). Intertrochanteric fractures generally occur between the bump, or greater trochanter, that you feel under the skin of the outside of your hip. Subtrochanteric fracture. A subtrochanteric fracture occurs between an area just below the lesser trochanter of the femur. In severe cases, the amount of breakage to the femur bone can involve more than one of these areas, sometimes causing the femur to break into several pieces. What are the Best Treatments for a Hip Fracture? Non-surgical treatment. Certain types of fractures, which are stable enough to be managed without surgery, which can be treated with immobilization. However, immobilization of the hip often requires a patient to be confined to bed, and thus the risk of prolonged immobilization must be considered, including infections, pneumonia, bed sores, and blood clots. Surgical treatment. Most hip fractures require surgery. An intracapsular fracture (a fracture to the ball of the femur) can often be fixed by inserting individual surgical screws. However, sometimes, the blood supply to the ball or head of the femur may be compromised. In younger patients, even though the fracture is realigned and fixed into place, the cartilage and underlying supporting bone may not receive an adequate blood supply, and over time the femoral head may flatten out, creating an irregular surface. In older patients, hip replacement may be ordered. Intertrochanteric fractures are often repaired using a hip screw or intramedullary nail, which allows for compression at the fracture site. Subtrochanteric fractures may require the use of a plate, rather than a screw or nail, allowing the screws to be placed through the plate and into the bone to create stability. Recovering from a hip surgery takes time and is often quite painful. Medications are often used to reduce pain, but opioid dependence can be an unfortunate consequence. Patients will often be ordered to pursue lengthy, regular physical therapy depending on the nature and extent of the injury to strengthen the joint and increase mobility to allow a patient to walk. This can take several months. The statistical odds of breaking your hip goes up significantly as we age. It is recommended that each of us should talk to our doctor to evaluate the risk of falling. Your doctor should review all medicines you may be taking to avoid symptoms of dizziness or sleepiness, which can increase the risk of a fall down. This includes both prescription and over-the-counter medications. Most older adults should be taking vitamin D supplements to lessen the extent of brittle bone disorders, like osteoporosis. And older adults should be screened for osteoporosis and treated, if needed. Strength exercises can improve balance, in addition to other physical benefits. Finally, you should have your eyes checked once a year to be certain that impaired vision does not contribute to a fall down. Inside the home, get rid of small objects in the home that could cause you to trip. Add grab bars to the outside and inside of showers and next to toilets. If possible, railings should be installed on both sides of stairs, and steps be taken to make sure that stairwells are adequately lighted. Wondering what your hip injury case may be worth? If so, give us a call. You may be entitled to a substantial settlement if you have been injured. The knowledgeable lawyers at John J. Malm & Associates have successfully handled complicated hip fracture cases for our clients, and we want to help you, too. We are an experienced personal injury law firm representing individuals and families who have suffered an injury or loss due to an accident. Call (630) 527-4177, or (312) 422-6855, and speak with Attorney John J. Malm and his team today.